Sydney Shop Girl: Lovin' Life 14/12/2017: Summer Living. Being stuck in traffic in the Inner West is almost a joy when the sky outside is as blue as the Transport NSW bus you're waiting behind. The tree I see in the distance reminds me of the groves of pine trees back home near Cottesloe Beach, another place of many happy summer memories in my heart. The track pants of winter give way to track shorts in Preschooler SSG's wardrobe. I found these at Cotton On and possibly love them even more than their wearer. That faded chambray blue, the comfy elasticated drawstring waist and those embroidered palm trees. Cotton On Kids is where you'll find them in case you were looking. I've linked to the style but unfortunately, I couldn't find this design online for you. In summer it's never too early to head to the pool when you're visiting friends. And if you're told that you have to wait until the adults have had lunch and gotten changed then you occupy yourself by dressing an obliging stone lion in your gear while the adults get their act together. Summer is all about the hat. Remember my recent search for a white Panama with a black band? Well, the search is over thanks to Sydney based but Columbian made lifestyle label Carolina. Isn't their packaging lovely? This is the Monaco hat ($129.99 AUD) made from Iraca palm and I love it to bits already. In the frocktastic department, Carolina have an amazing range of easy wear and easy care dresses and tunics. If you're either over kaftans or in need of some contrast to your collection of them, Carolina's range of neutrals, stripes and romantic florals is worth a look. Nothing's overly trendy or revealing. Instead it's all about looking instantly effortless yet on point for summer the moment you shimmy a tunic over your head. This is the Habana tunic ($189.99 AUD) in black and it's got a high / low hemline and sleeves that you can wear buttoned down like a shirt or else rolled up thanks to handy internal straps in each sleeve. I'm still working on my Palm Beach-worthy tan (and abs) but at least I have the hat and frock to pretend I'm there as I waltz around Woolworths trying to remember what I wrote on the list I forgot to bring with me. Someone finally got their swim over the weekend which gave him a chance to test out his new pool weights which were a birthday gift. To me they look like fluorescent jellyfish but what you're meant to do with them is throw them into the water and dive down after them. The fabric 'tentacles' are a bit more fun to search for than the standard hoops and sticks that swim schools use. They also look very pretty in the water. And you know what happens after Sunday afternoon backyard swims, don't you? Post swim snacks that are both appropriately summery and suitably festive. 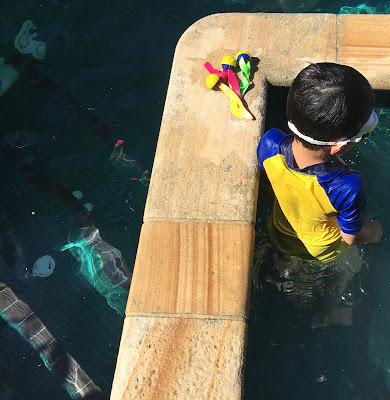 I have fond memories of my eight-year-old self eating her body weight in fruit, jelly and lollies in wet bathers while drying off on my towel in a patch of sun. The snacks were a bit more fancy over the weekend, though. My cheesecake garnished in a more orderly fashion than previous years thanks to Preschooler SSG. What do you love about summer living? If you're not a summer person. what gets you through? Another great post to read SSG! Your preschooler must be getting excited for Christmas and that cheesecake looks absolutely divine and very festive. I love seeing a beautiful blue sky - it always makes me feel happy. Best wishes and love to you and your family for Christmas and the New Year. I loved dive sticks and rings so much as a kid! Oh I love those strawberry Santa hats! I might just borrow that idea for my Christmas BBQ on Sunday. The strawberry santa hats are very very cute! For me it's cocktails and outside entertaining. Love those Santa hats. So easy but I've never thought of using strawberries that way. Summertime in the pool always creates the best memories! I like your summer wardrobe updates too - I wish I was a hat person as they really are an essential in the heat here. I always feel out of place in mine but put that aside on beach days to get the sun protection benefits! Apart from the effects of hayfever at the start of the season, i'm very much a summer person. The beach is a happy place for me and much to the 18yr old's horror, I've claimed the boogie board that he was going to discard and can't wait to give it a try. Good finds at Carolina. I love all four seasons where I am. So strange to be reading about your swimming days when we are drowning in rain. Love the hat. Love your hat and LOVE the Santa strawberry hats. Also love the dressed up lion! LOL. As you say, so much much to love in Summer.